Contact the owner Ronald @ 540-798-3177 or mist1(at)cox(dot)net.Beautiful 1997 Sea Ray 400 Sedan Bridge. Twin MerCruiser T7.4L gas engines, Fresh water cooling, Fuel injected, Electronic ignition. Westerbeke 9KW gas generator, fresh water cooling. This boat has been very well maintained and cared for. Full electronics including radar and autopilot. New Raymarine Tridata depth sounding system. Over $40,000 in updates by current owner over past 3 years. New bottom paint and anodes, New ice maker, New HD flat screen TV/DVD player with premium Bose sound system. VacuFlush system rebuilt and updated, New holding tank. New premium interior carpet, New hardwood floor in galley. New cockpit custom extended camper canvas cover and enclosure. New upholstery on fly bridge sofas and 3 captain's seats. 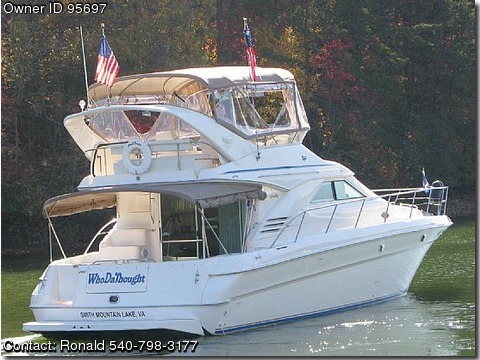 This boat is truly a turnkey boat in excellent condition top to bottom, inside and out. Waxed waterline up at least once per year. Additional pictures, info, records and receipts are available. Waterline length is 40 feet, overall length is 44 feet. Beam is 14 feet, 3 inches.